The environmental "tipping point" we approach is more palpable each day, and people are seeing it in ways they can no longer ignore--we need only turn on the news to hear the litany of what is wrong around us. Serious reflection, inspiration, and direction on how to approach the future are now critical. Hope Beneath Our Feet creates a space for change with stories, meditations, and essays that address the question, "If our world is facing an imminent environmental catastrophe, how do I live my life right now?" This collection provides tools, both practical and spiritual, to those who care about our world and to those who are just now realizing they need to care. 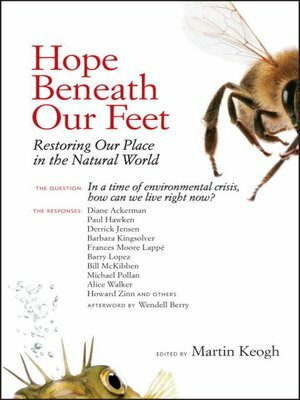 Featuring prominent environmentalists, artists, CEOs, grassroots activists, religious figures, scientists, policy makers, and indigenous leaders, Hope Beneath Our Feet shows readers how to find constructive ways to channel their energies and fight despair with engagement and participation. Presenting diverse strategies for change as well as grounds for hope, the contributors to this anthology celebrate the ways in which we can all engage in beneficial action for ourselves, our communities, and the world.